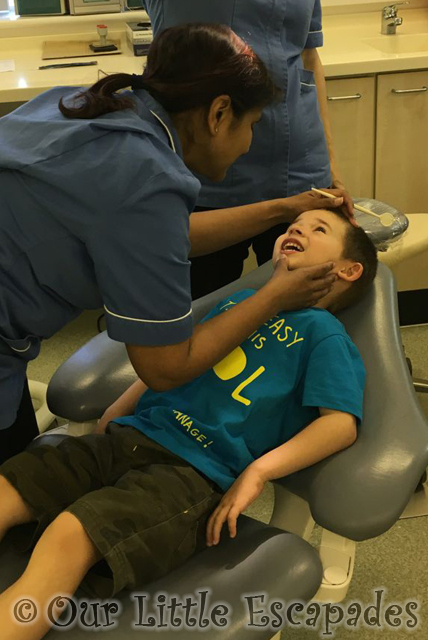 Last week Ethan had his second dentist appointment at the Special Needs Dentist since we used the Monkey Wellbeing book to visually show Ethan what to expect at the appointments. His first appointment went well and he did open his mouth a little bit for the dentist to try to look at his teeth. 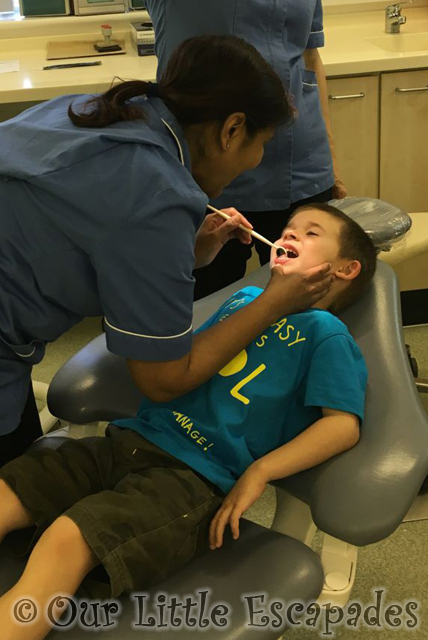 This was of course with Darren’s help and Ethan was sitting on Darren’s lap whilst the dentist tried to see his teeth. We wasn’t sure how this appointment was going to go. We had told Ethan he was going to the dentist after school and he was OK when we arrived. We did make the mistake of not taking Little E’s buggy and she ended up having too much fun running around resulting in Darren having to take her back to the car. This did worry me as Darren is the only one that can hold Ethan still and I did think we would just end up chasing Ethan around the room at this appointment. …and it was all of Ethan’s own doing. Not only did Ethan sit in the dentist chair and give her enough time to look in his mouth but he also let the dentist use the mirror to get a better look at his teeth. This is the first time we have ever got this far. I couldn’t believe what I was seeing, I had to take a photo. This may never happen again! I’m so proud of Ethan, we have come so far to get this point but this amazing moment was hit with negative news. We need to brush Ethan’s back teeth a lot better than we have been. This is one of our massive battles with Ethan. It has been a long slow progress with Ethan and the toothbrush and he only really lets us near his front teeth. They did show me a few new techniques to try which will hopefully mean we will be able to brush his back teeth more than we has been able to. So as always on our journey its small steps, but in our world they are amazing achievements. Oh wow! Well done Ethan! This is fantastic! Wow, well done Ethan!! Amazing achievement. I had never heard of Sen dentists before but think they are a great idea, especially if this happens. Oh no about the back teeth. Is there anything he can chew that could help this? Bravo! well done Ethan! the dentist is one of my ongoing *things* with Sir 🙂 I shall show him the photo and see it encourages him!